Tilted Horizons: Dakar Rally Starts Today! Today the 30th running of the world's toughest (and perhaps deadliest) motorcycle race kicks off. 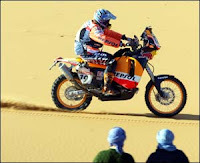 The Dakar Rally (formerly the Paris - Dakar Rally) has always been a Saharan affair, but after 2008's 11th-hour cancellation due to terrorism threats in Mauritania, this year's route will be entirely within Argentina and Chile. Traditional TV coverage for we Yanks is always nearly non-existent (rumor is that daily highlights will be shown on Versus Network), but the Dakar website promises live updates and some Googlin' and YouTubin' may yield some team or spectator video, or other 'Net coverage.